Last night's game was quite disappointing. It would be a massive understatement to say that our team left a lot to be desired. Having no recognised striker on the pitch, Brad Smith's ball-watching and losing the ball cheaply through turnovers (amongst many other things) all made for painful viewing. I am more disappointed however with our wasted potential and our leader's refusal to change his management of the team. I think we could have snatched a draw if our set up was different. Postecoglou somehow has this stubborn idea that we must play possession-based football like those mighty European teams. But there is more than one way to win a football match. In any situation in life, it is important to be flexible and not to stick to an ideal so rigidly. Ryan and our defenders faced ridiculous pressure by trying to 'play out the back' even when they were harrassed by Japanese forwards. There is nothing wrong with hoofing the ball out in such circumstances; that does not make us barbarians and people will not think any less of us. We simply don't have the quality to hang on to the ball in those kinds of situations. And there is nothing wrong with that but we must first admit this and adapt accordingly. Similarly, it is silly to refuse to cross the ball into the penalty box (because we want to play possession-based football) when we are so much stronger than the Japanese in terms of our physical strength and height. Why should we not play to our strengths?! In short, all sport requires athletes to be fluid and flexible - we shouldn't stick to one philosophy only Ange. We need to mix it up and be willing to change depending on the situation. But that's all in the past now, and we have to look to Tuesday now. Somehow I don't think Ange will change anything. If Saudi Arabia beats Japan 1-0, Australia needs to beat Thailand by 3 goals. This is because both teams will be tied on Goal Difference (+7) and Goals Scored (17). The next tie breaker is head to head record, and Australia have the better record having beaten and drawn to Saudi to get 4 points vs their 2 points. If Saudi Arabia beats Japan 2-0 or 2-1, Australia needs to beat Thailand by 4 goals. The latter scenario is due to the fact that Saudi Arabia will have 18 goals for them and Australia will only have 17 if 3 goals are scored. Goals scored is the next tiebreaker after goal difference. Similarly, if the Saudis win 3-2 we need to win 4-0 - the winning requirement is capped at 4-0 if the Saudis win by a margin of 1. If Saudi Arabia draw or lose to Japan, any Australian win is enough. UAE will be hoping Thailand beat Australia, but they do need to beat Iraq by 5 goals away from home (Goals For will be 15 > 14 if Australia do not score). If we can't beat Thailand by 3 goals at minimum, we arguably do not deserve to go to the World Cup. We eagerly anticipate Tuesday 8pm, 5 September 2017. Meanwhile, in Group A, plenty of crazy things are happening. - China needs at least 3 goals against Qatar in Doha, while hoping that South Korea and Iran finish off Uzbekistan and Syria respectively. - If either Syria or Uzbekistan win, that is at least 3rd place sealed for that team (2nd in Syria's case); if both win, Syria actually probably qualifies automatically! 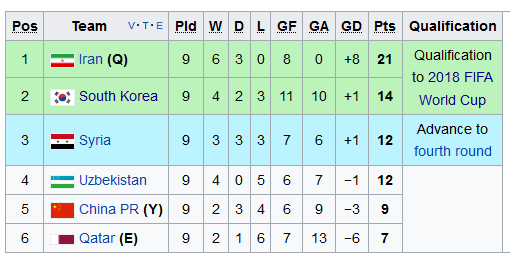 As much as I like the Koreans, I personally hope that Uzbekistan can overcome South Korea.